GOP debates are usually filled with at least a few good jokes, but they don’t always start off as awkward as Ben Carson’s New Hampshire entry which was a complete blunder that conjured similarities of a Saturday Night Live comedy skit. Dr. Ben Carson‘s didn’t hear his name announced during introductions and started somewhat of a comical traffic jam. The retired neurosurgeon stayed off the stage waiting while the camera remained on him and Ted Cruz walked around him. 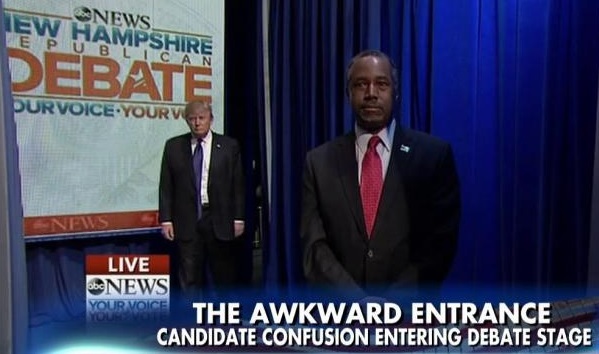 Donald Trump also failed to hear his name and he stood offstage with Carson. Can’t help but laugh watching Trump and Carson wait next to each other as the opposition proceeds to the stage.